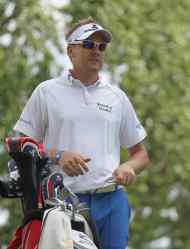 Ian Poulter is one of the more colourful characters on the golfing scene and plays on both the US PGA Tour and the European Tour. He has been as high as number 5 in the world rankings but is still seeking his first Major tournament success. Poulter enjoyed his first success at the Open de Côte d'Ivoire in 1999 on the European Tour's second tier Challenge Tour, earning promotion to the Tour itself through the qualifying school the same year. He made an immediate impact when claiming the Italian Open title and was named the Sir Henry Cotton Rookie of the Year for 2000. Poulter won the Moroccan Open in 2001, reclaimed the Italian Open title in 2002 and won the Welsh and Nordic Opens of 2003. He achieved his biggest success when winning the prestigious Volvo Masters in 2004. He was also a key member of the successful European Ryder Cup team that year, officially scored the winning points. In 2005 he took up membership of the US PGA Tour and started dividing his time between that and the European circuit. Although he is yet to win a Major, he held the clubhouse lead on the final day in 2008 before being beaten by defending champion Padraig Harrington. In the same season, Poulter produced a hole-in-one at the 16th hole in the Masters. Poulter was the highest points scorer on either team at the 2008 Ryder Cup, despite the Europeans losing out by 16.5 to 11.5. Poulter was also runner-up in the 2009 Players Championship, finishing four shots adrift of Henrik Stenson. He later won the Barclays Singapore Open at the Sentosa Club and climbed into the World’s Top Ten when finishing second in the Abu Dhabi Golf Championship. In February 2010, he claimed his first victory on American soil when beating Paul Casey 4&2 in the final of the WGC-Accenture Match Play Championship in Arizona. He again earned his place in Europe’s Ryder Cup team and won 3 points out of a possible 4 in the one-point victory at Celtic Manor in Wales. In November he won the UBS Hong Kong Open. In 2011, Poulter defeated Luke Donald 2&1 in the final of the Volvo World Match Play Championship having previously beaten the world number one Lee Westwood. This marked Poulter's second match play success and his eleventh European Tour victory. European Ryder Cup Captain José María Olazábal named Poulter as one of two "Captain’s picks" for the 2012 Ryder Cup and he repaid his skipper’s faith by winning all four matches. Poulter closed out his year with a second World Golf Championship of his career at the WGC-HSBC Champions in Shenzhen, China. Poulter is well known for his eccentricity and his bizarre dress code. Although he is sometimes controversial and outspoken, he remains a true professional on the golf course and would be a popular winner if he could get his name on the Major’s roll of honour.